If you have any questions or want to enquire about dates, use our form to contact Isabelle Mountain or see their website for more information. 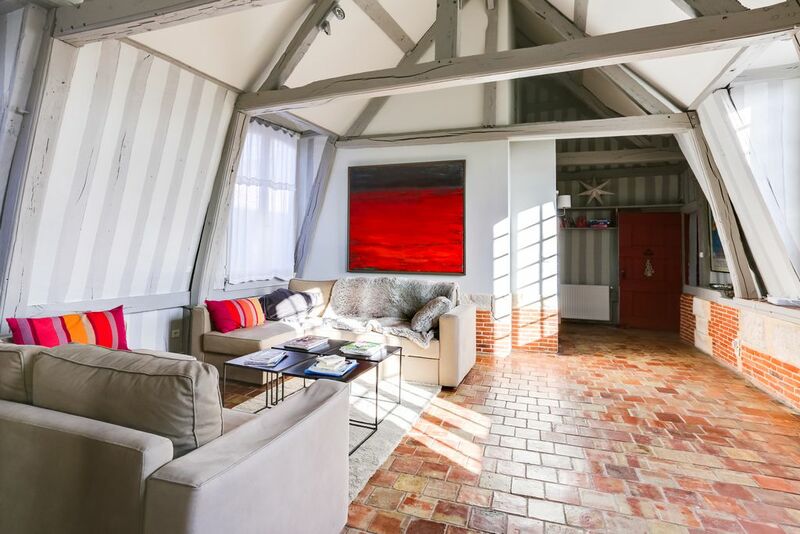 Have you visited Le Loft? Be the first to leave a review. A former storage place for tobacco leaves in the 18th century, it has been transformed into a flat 10 years ago. The place Hamelin used to be a bustling area for merchants at the height of Honfleur's maritime activity. The fountain in the courtyard was given by the town to the rich shipowner for his good services. You are literally in the heart of the historic part of town, minutes from the harbour and the museums (Boudin and Maisons Satie), and you'll spoiled for choice with all the restaurants in the area. Every Saturday, a food market takes place on Place Sainte-Catherine, just up the stairs at the end of the alley. Go for the local producers, even if they are not stamped "organic", you're more likely to get tasty veg & fruit, naturally grown. In the morning, go to the harbour (le Vieux Bassin) and sit at one of the numerous cafés (my favorite is l'Albatros) and enjoy a nice breakfast or just coffee while watching the world go by. You are a 15 mn walk from the beach. You can explore the park alongside the jetty - le jardin des personnalités.